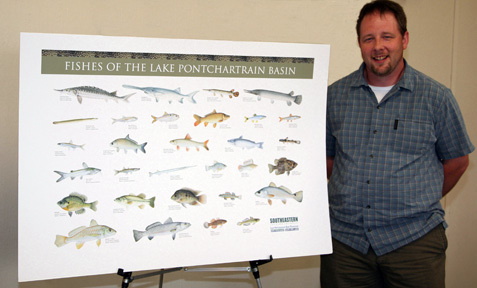 Kyle Piller, assistant professor of biological sciences, stands by his poster depicting the fishes of the Lake Pontchartrain Basin, a project produced through a grant from the Lake Pontchartrain Basin Foundation. The poster was designed by Southeastern Public Information Office graphic designer Terry Bahm. 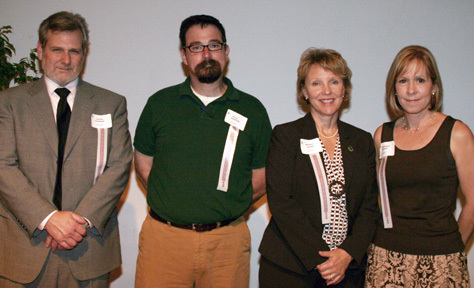 The Southeastern Office of Sponsored Research and Programs on May 1 recognized university grant recipients. So far this year, more than 125 new proposals by faculty and staff have been funded with nearly $10 million in grants and contracts. The young musicians of Southeastern's Community Music School will shine in a special concert May 6 at the Pottle Music Building Auditorium. The free concert, "Shining Stars," scheduled for 7:30 p.m., will feature soloists Tessa Flesher of Lacombe, Ashley Johansen of Madisonville, Michael Kepner of Covington, and Chloe Williams, Christina Colonna and Angelina Vychko of Mandeville. The young violinists will perform with an orchestra of Southeastern music students, conducted by Yakov Voldman, director of the Department of Music and Dramatic Arts string program. The soloists are from the violin studios of Jivka Jeleva, Community Music School violin instructor, and Dr. Voldman. Jeleva described the young musicians as "the most dedicated" of CMS's violinists. The concert, she said, "is the opportunity for them to be rewarded for their hard work." The concert will also feature the CMS String Ensemble, as well as the newly formed group of fiddlers, "Dancing Fiddles." The repertoire of "Dancing Fiddles" incorporates intricate choreography in the performance of famous fiddle tunes. Founded in 1996, Southeastern's Community Music School offers children and adults private and group music lessons taught by Southeastern faculty members, graduate students and community professionals. For information visit www.selu.edu/music/cms or contact CMS at 985-549-5502. A poem by Southeastern poet and English professor Allison Pelegrin will be included today at 2 p.m. on Garrison Keillor's nationally-broadcast program, The Writer's Almanac. Keillor will read "Go, Poem," from Pelegrin's Big Muddy River of Stars, published last year by the University of Akron Press. The program can be heard of WWNO public radio or at writersalmanac.publicradio.org. Parents looking for challenging, creative and fun summer activities for elementary children will find a wide variety of programs offered by Southeastern. The "Academic Adventures" summer camps, which focus on topics from Spanish culture to science, will be back this year as will popular recreation day camp sessions and music, art, writing and sports camps, all under the administrative umbrella of Southeastern's Division of Continuing Education. The Academic Adventure camps will be held at the Southeastern Laboratory School cafeteria and at the Livingston Parish Literacy and Technology Center in Walker, said Coordinator Linda Munchausen. "Fiesta Camp," June 9-20, 9:30-11:30 a.m. (Session I) or 1:30-3:30 p.m. (Session II), weekdays, Lab School, $100. Open to ages 5-11, the camp will explore Hispanic culture through craft, dance, and art with an instructor who is fluent in Spanish and enthusiastic about sharing her culture with children. Campers will participate in cultural activities such as dancing, singing, arts and crafts, conversation, games, outdoor activities, and talent shows to stimulate their interest in foreign languages. "Space and Rockets '08," June 23-27, 9:30 a.m.-3:30 p.m., Lab School, $215. The popular camp will feature a new rocket design that will bring campers even closer to the stars this year. Campers will build the high-flying, solid-fueled rocket for launch day - parents invited! They will also make a working telescope, build a light-up model of the solar system, explore the secrets of Mars, and create a motorized K'Nex Mars Rover and fiber optic constellations in this unforgettable outer space adventure. The camp is open to students entering grades 2-5. Extended care is available from 7:30 a.m.-5:30 p.m. for an additional $10. Young Writers Camp, June 23 - 27, 9 a.m.-3 p.m., Lab School, $195. Cafeteria. Young authors ages 8 to 14 can write to their heart's content under the guidance of the faculty of the Southeastern Louisiana Writing Project. Daily activities will include writing; connecting the writing process with photography and printmaking; story quilts; cartooning; many other creative activities incorporating reading, writing, and art. Campers will polish their work through peer editing, and work will be published in an anthology. The final day young writers will present their best work to parents and friends at a "Coffee House Reading." For more Information, contact Beth Calloway scalloway@selu.edu or Richard Louth, rlouth@selu.edu, 985-549-2102/2100. "Gizmo's Gadgets and Goop," July 7-11, 9:30 a.m.-3:30 p.m., weekdays, Lab School, $215. Science and imagination join forces as children entering grades 2-5 build electronic gadgets while learning basic principles of electricity. Campers will explore the science behind batteries, bulbs and buzzers and enter the "Invention Dimension" to design and create motorized K'Nex racers, roller coasters, planes and more. Extended care is available from 7:30 a.m.-5:30 p.m. for an additional $10. "Let's 'BEE' Creative," July 7-17 (Mon.-Thurs. ), Morning Session: 9:30- 11 a.m., Afternoon Session: 2-3:30 p.m., Clark Hall, $50. Sponsored by the Departments of Visual Arts and Continuing Education, students ages 5-14 will create a variety of artwork using different media based on the theme "Let's BEE Creative." Students will model with Crayola's Model Magic, create mixed media collages, create their own stencils, paint paintings, and make nature prints. Children 10-14 years of age will complete two fabric art projects. Children enrolled in the workshop will be instructed by art students under the supervision of Yvonne James. Enrollment will be limited to 75 students in each session. Children will be enrolled on a first come, first serve basis. Southeastern Music Festival, July 7-18 (weekdays), 9 a.m.-4 p.m. (week one), 9 a.m.-7 p.m. (week two), Ralph R. Pottle Music Building, $325. The Southeastern Music Festival offers a challenging musical experience for young musicians, grades 3-12. SMF offers instruction on all orchestral and band instruments, piano, voice, string, piano and guitar (all styles). Instruction includes private lessons, large ensemble experience, concerts, masterclasses, chamber music studies, and music rudiments and theory classes. They will gain experience in large ensembles and on the concert stage - all in a supportive and encouraging environment. "Extreme Sports Science," July 21-25, 9:30 a.m.-3:30 p.m., weekdays, Lab School, $215. Campers entering grades 2-5 will build a fitness kit and study basic human anatomy. As they take part in wacky competitions and go for the gold in the closing ceremonies, they will listen to their heartbeat with a stethoscope, measure their pulse, build a skeleton, and explore the buoyancy of swimming, the tricks to balance and the aerodynamics of racing. From learning about wellness to understanding the human body's amazing capabilities, the camp delivers a healthy dose of fitness and science. Extended care is available from 7:30 a.m.-5:30 p.m. for an additional $10. "Science Detectives," July 28-Aug. 1, 9:30 a.m.- 3:30 p.m., weekdays, Lab School, $125. Campers will build their own Science Detective kit, including flashlights, microscopes, and periscopes. They will put the tools to the test exploring the science mysteries behind magnets, phosphorescence and invisible ink. They will also use forensics to discover the "culprit" behind a missing ice cream recipe, make ice cream and earn a "Science Adventures Detective Badge." The session will be open to students entering grades 2-5. The cost is $215 and extended care is available from 7:30 a.m.-5:30 p.m. for an additional $10. "Writing is Fun!," June 16-20, 8 a.m.-noon, weekdays, $120. Children ages 8-14 Cost $120. Under the guidance of experienced English teacher, Dr. Beth Calloway, campers will incorporate reading, writing,and art in a special project and publish an anthology. Other events include a journal writing marathon with a "Coffee House Reading" for parents and friends on the final day of the camp. A second and slightly shorter version of the Science Detectives camp will be offered June 23-27, 8 a.m.-noon, weekdays, Livingston Center. The camp is for children entering grades 3-5 and costs $120. For both Livingston Center camps, pre-camp care is available from 7:15- 8 a.m. for an additional $10. Continuing Education also coordinates the Children's Art Workshop, July 7-17; the Southeastern Music Festival, July 7-18; and four two-week sessions throughout the summer of the Children's Summer Day Camp. Southeastern will also be the site of a variety of sports, dance team and cheerleader camps, also coordinated by Continuing Education. For information and registration forms for Southeastern summer camps visit www.selu.edu/summercamps or contact Munchausen, 985-549-3935, Continuing Education, 985-549-2301, or the Livingston Center, 225-665-3303. A design by Maria Justiniano, a native of Bolivia now residing in Folsom, was selected for the poster promoting A Drum, A Drum, an original musical produced by Hammond's Academic Center for the Visual and Performing Arts in connection with Ponchatoula's "Strawberry Jam'n Toast to the Arts Festival," scheduled next weekend. Justiniano, a junior graphic design major, is a student in Visual Arts instructor Karin Eberhardt's Art 261 (Digital Print 2) class. The class was contacted earlier this semester by Artie Fellom Gautier of the Academic Center for the Visual and Performing Arts, Hammond's magnet school. "I loved the idea of a service-learning project," said Eberhardt. "It gives students a good taste of the real world." A Drum, A Drum was performed May 3 at the Columbia Theatre for the Performing Arts. Thanks to support for the production from musician and physician Ted Hudspeth's Northshore Regional Endowment for the Arts, Gautier hopes to take the show on the road in the fall, touching every pre-K through third-grade student in parish. Justiniano's winning design was one of 21 submitted by students in Eberhardt's class who created designs for the poster. She said the assignment was perfect for her because she likes art associated with children and is fascinated by India, the setting for . "I read the script and really liked the story," she added. She also researched the country and its artistic heritage. Gautier said Justiniano's was selected because, "It was striking, it caught the eye with its vivid colors." "I love graphic design," said Justiniano, "I like to read every article I can find on the subject. It's my passion." Organized by the Northshore Regional Endowment For the Arts, Strawberry Jam'n Toast to the Arts will feature more than 70 bands and performances on stages throughout downtown Ponchatoula. KSLU radio station will feature a Guitar Hero Stage and contest where anyone can "Jam at the Jam" and compete for prizes. Another new addition to this year's Jam will be the region's first "Film Festival," organized for Friday evening, May 9, by Southeastern faculty Alan Marsh and Martie Fellom. It will feature short films from producers in this area and will be held in the Speakeasy Restaurant beginning at 6 p.m. The Northshore Regional Endowment for the Arts has supported scholarships for the Southeastern Community Music School's summer program, the Southeastern Music Festival. For more about Strawberry Jam'n Toast to the Arts, visit www.strawberryjam.org. Motorists and visitors planning to attend Southeastern's commencement ceremonies on Saturday, May 17, should anticipate heavy traffic and route changes affecting University Avenue (Hwy. 3234). Louisiana Lt. Governor Mitchell Landrieu will address more than 1,060 students receiving associate, bachelor's and master's degrees at the 10 a.m. ceremony in the University Center. Mike Prescott, director of University Police, said the section of University Avenue between West Tornado Drive and SGA Drive will be restricted from 7:30 a.m. to 1:30 p.m. that day. Local traffic will be allowed to proceed on University Avenue for as long as possible, but will be diverted through the campus as congestion increases. Prior to commencement, the University Center parking areas are expected to be filled early and all traffic on University Avenue will be diverted. Eastbound commencement traffic will be diverted to West Tornado Drive for parking at the University Center and westbound commencement traffic will be diverted to the campus at SGA Drive. Three Southeastern Lion Traxx Shuttle Busses will be in operation before and after the ceremony to accommodate those parking in outlying areas or needing special transportation assistance, Prescott said. Drivers not attending commencement are asked to use U.S. 190 (Thomas Street and Morris Street) or Natalbany Road (Hwy. 1064) to avoid University Avenue traffic. 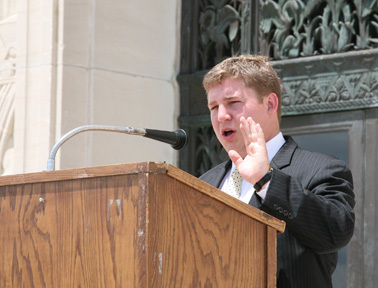 Student Government Association President Chris Barcelona speaks from the Capitol steps in Baton Rouge at a May 1 rally of student leaders protesting House Bill 199 which would make it legal to carry licensed concealed handguns on all public and private colleges in Louisiana. Barcelona joined a number of other University of Louisiana System SGA presidents who spoke against the bill. The staff of The Lion's Roar, Southeastern's student newspaper, brought home eight awards from the Louisiana Press Association's annual convention held April 26 in Lafayette. Staff member Jessica Fredrick of Hammond garnered a first place standing in the "Best Column" category, while graduate assistant Benjamin Kerr, also of Hammond, earned an honorable mention. Photo Editor Allyson O'Keefe of New Orleans earned a second place award in the "Best General News or Feature Photo" category for her picture of the "Pilobolus" dance performance, which was part of the university's Fanfare presentation in October. Staff member Zach Boudreaux of Walker also took a second place standing in the "Best Sports Story or Sports Feature" category for his article entitled "Lion's Honor Currie" which ran in the Aug. 28 issue. "I was very excited about our awards," said Lion's Roar Editor in Chief Tracy Valentine of Montpelier. "I have learned a great deal about what it takes to create award-winning articles and photos, so I know we can earn more in the future when we compete in next year's LPA competition." Director of Student Publications Lee E. Lind also earned several awards in the advertising section of the competition. Lind won a second place and an honorable mention in the "Black & White ½ Page or Under" category. He also won an additional second place and honorable mention standing in the "Color ½ Page or Under" category. "Our students did very well this year," said Lind. "I'm sure as this staff matures, they will only earn additional recognition for themselves and the university." Eighty-four newspapers, publications, and college/university student newspapers submitted more than 4,400 entries for judging in this year's competition. Judging the competitors were members of the Washington Newspaper Publishers Association. The Lion's Roar has received both state and national recognition in the past several years, including a total of 23 awards from the LPA in the past four years. Jazz Ensemble II will present "Brick House!," a "high-energy and funky" program of jazz hits, Wednesday, May 7, at the Pottle Music Building Auditorium, said Director Richard Schwartz. The 20-member ensemble's spring concert begins at 7:30 p.m. and is free to the campus and community. The concert will feature guest saxophone artist John Lyons, who will perform "Blues fur Elise," a blues arrangement of the Beethoven classic, and Duke Ellington's "Caravan." Jazz Ensemble II will also perform "In the Stone," "Straighten Up and Fly Right," "Morning Sunrise," "Bye Bye Blackbird," "Oye Como Va" and Lionel Richie's "Brick House." Lyons, a New Orleans native, played his first gig as a 12-year-old. With a soulful style reminiscent of Lenny Picket and Michael Brecker, Lyons has performed with artists Percy Sledge, Luther Kent, Vince Vance, the Coaster, the Platter, the Marvelettes, Irma Thomas, T. Graham Brown, Doug Kershaw and the Class Rock All Stars. He has spent several years as lead tenor with local bands including his latest, "Soul Vaxxination." He also has performed in other countries, including a 2001 performance for more than 40,000 fans at the Montreal Jazz Festival. Jazz Ensemble II's eclectic repertoire ranges from classic standards by composers such as Johnny Mandel, Harold Arlen and Johnny Burke to more modern works by John Coltraine, Thelonious Monk, Miles Davis and others. In addition to its annual semester concerts, the group has also joined in community events such as the Christwood Lecture Series in St. Tammany Parish, the Ponchatoula Strawberry Toast and Jam Festival and Riverfest in Vicksburg, Miss. Members are Aaron Turnipseed and Durand Jones, alto saxophone; Corey Reeves and Joseph Jones, tenor saxophone; Christopher Gautreaux, baritone saxophone; Nicholas Dawson, Ben Livingston, Antonio Sasso, Joshua Olsen and Joseph Marshall, trumpet; Justin Talkington, Jamie Foster and Darell Haynes, trombone; Judy Bardwell and John Holley, piano; Justin Burdette and Eric Johns, guitar; George Bosnea, electric bass; A.J. Lassere and Robert Nicholson, drums. For additional information, contact Schwartz at richard.schwartz@selu.edu or 985-549-5938. Roger McGuinn, co-founder of the legendary group the Byrds, is coming to the Columbia Theatre for the Performing Arts May 9. 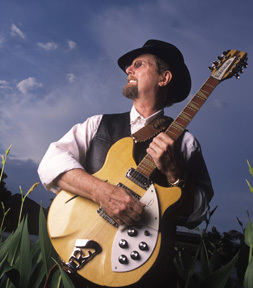 McGuinn, who has been electrifying audiences with his rock, blues and folk music for four decades, will appear at the historic downtown Hammond theater at 7:30 p.m.
"It is an honor for Columbia to be presenting Roger McGuinn, whose artistry on guitar has grown ever richer since his days with the Byrds," said Columbia Director Donna Gay Anderson. "He is a living legend who has not simply rested on his past successes. He is still creating and still growing. The concert will be a very special one indeed." McGuinn was already a veteran of the New York and Los Angeles music scene when he co-founded the group that would become the Byrds with Gene Clark and David Crosby in 1964. A Chicago native, McGuinn studied at the Old Town School of Folk Music and was active in the Chicago's folk scene. After the Byrds disbanded in 1973, McGuinn made five solo albums on Columbia Records. In 1981, he decided to return to his folk music roots. His CD Treasures from the Folk Den, was nominated for a Grammy in 2002 in the category of "Best Traditional Folk Album." The CD includes favorite songs from the Folk Den with the added bonus of duets with Pete Seeger, Joan Baez, Judy Collins, Odetta, Jean Ritchie, Josh White Jr. and Frank and Mary Hamilton. Tickets for Roger McGuinn are $28, Orchestra 1 and Loge; $24, Orchestra 2 and Balcony 1; and $19, Orchestra 3 and Balcony 2. They are available online at www.columbiatheatre.org or at the Columbia box office, 220 E. Thomas St., 985-543-4371. Box office hours are noon-5 p.m., Monday, Wednesday and Friday, noon-3:30 p.m., Tuesday and Thursday, and one hour before performance times. For information about upcoming events in the Columbia Theatre, visit www.columbiatheatre.org or call (985) 543-4366. Southeastern students will have the opportunity to try out for the part of Southeastern's lion mascot, "Roomie." Auditions will be held Thursday, May 8, at 4 p.m. in the Pottle Music Building Annex band room. The audition is open to Southeastern students only. Students auditioning for Roomie must prepare and perform a two-minute skit demonstrating school spirit and crowd interaction. The student selected as the university mascot will receive a scholarship for both the fall and spring semesters. For an application form or more information, contact Paige Lapeyrouse at 985-549-3654 or paige.lapeyrouse@selu.edu. Southeastern is pleased to be able to offer students a Textbook Rental Program, providing the opportunity to rent instead of buy required textbooks. This program provides an economical alternative to purchasing textbooks and saves students hundreds of dollars each semester. However, there are some courses that do require the purchase of supplemental books, including but not limited to, workbooks, manuals, special topic texts, etc. In an effort to ensure that students are aware as early as possible of the books that will need to be purchased, which will allow students to better prepare for that purchase, a listing of the books that students will need to purchase for the fall 2008 semester has been made available at www.selu.edu/books2buy. This list includes the necessary information to purchase the required book either through the Follett University Bookstore or some other source (course, section, title, author, and ISBN number). The list will be updated regularly. Please contact Auxiliary Services at auxiliary_services@selu.edu or (985) 549-2094 with any questions regarding this information. The University Police Department reminds all students, faculty, and staff that bicycles abandoned on campus at the end of the semester may be tagged and are subject to removal if not claimed prior to Saturday, May 17. For more information regarding the University's policy regarding abandoned bicycles, please view Section X of the University's Traffic and Parking Regulations at www.selu.edu/admin/police/assets/Campus_Parking_Regul.pdf. The softball and track and field teams will compete in their respective Southland Conference Championships during this week in Southeastern Athletics. The Lady Lion softball team (27-24, 14-15 SLC) will be in the Southland Conference Tournament for the first time since 2002. Southeastern will open the single elimination tournament in San Marcos, Texas versus McNeese State on Thursday at 11 a.m. Should the Lady Lions get past the Cowgirls, Southeastern would move into the quarterfinals versus Stephen F. Austin at 4 p.m. on Thursday. A win over SFA on Thursday would allow Southeastern to advance to the semifinals on Friday versus tournament host and No. 1 seed Texas State at 6:30 p.m. The semifinal winners will face each other on Saturday at 4 p.m. The tournament winner will receive an automatic berth in the NCAA Tournament. Thursday's 11 a.m. tournament game will not be broadcast due to previously scheduled programming. Should Southeastern advance past the opening game, all the remaining Lady Lion tournament games will be broadcast in the Hammond area on KSLU 90.9 FM and on the Internet at www.LionSports.net. The track and field teams will compete in the Southland Conference Outdoor Championships in Huntsville, Texas. The Lions and Lady Lions will head to the Sam Houston State campus for the three-day meet, which runs Friday through Sunday. The Southeastern baseball team (24-23, 11-13 SLC) will close out its non-conference schedule this week, heading to Alcorn State for a 6 p.m. contest on Tuesday in Lorman, Miss. Southeastern will then return home for its final home series of the season, hosting Sam Houston State for a three-game set, beginning on Friday at 6:30 p.m. The series continues on Saturday with a 3 p.m. contest. Sunday's series finale is set for 1 p.m. Southeastern's senior class will be honored prior to Sunday's finale in a special pre-game Senior Day ceremony. Tuesday's game will not be broadcast. Friday and Saturday's games will be broadcast in the Hammond area on KSLU 90.9 FM and on the Internet at www.LionSports.net, unless the Southeastern softball team remains alive in the Southland Conference Tournament. If the Lady Lions remain in the tournament, Friday and Saturday's games will be broadcast on the Internet only. With the SLC Softball Tournament finishing up on Saturday, Sunday's series finale will be broadcast on KSLU 90.9 FM and on the Internet at www.LionSports.net. Baseball, at Alcorn State, Lorman, Miss., 6 p.m.
Softball, vs. McNeese State (SLC Tournament First Round), San Marcos, Texas, 11 a.m.
Southeastern faculty and alumni members inducted May 1 into the National Honor Society of Phi Kappa Phi on May 1 are, from left, David Hanson, head of the Department of English; Paul Sawyer, associate professor of English; Wendy Johns, assistant vice-president for university advancement; Deborah Dardis, associate professor of biological sciences, and (not shown) Stella Helluin, director of the St. Tammany Center. Dr. Rayma Harchar (Educational Leadership and Technology) presented "Mentoring and Supporting Aspiring School Leaders for the Next Generation in a University/District Partnership" to the National Association of Elementary School Principals and National Council of Professors of Educational Administration at the 19th Annual "Conference Within a Conference Program" at the in Nashville, Tenn., April 5-8. She also was elected vice president of the Louisiana Educational Research Association in February. Dr. Michael Toerner (Accounting) presented a paper, "A Comprehensive, Structured Approach to the Preparation of Consolidating Entries in Advanced Accounting," at the American Accounting Association Southeast Regional meeting in Birmingham, Ala., on April 4. Dr. David C. Wyld (Management) published an article, "Playing a Deadly Game of Match: How New Efforts to Use RFID in Blood Banking and Transfusion Can Save Patient Lives and Safeguard the Blood Supply Chain," in the March 2008 issue of Global Identification. Alan Marsh (English) and Martie Fellom (Music and Dramatic Arts) are curators for the Strawberry Jam 'n Toast First Annual Film Fest, which will be held on May 9 from 5:30-8:30 p.m. in the Courtyard at Speakeasy Alley in Rockefeller's Restaurant in Ponchatoula, La. The film fest highlights the work of local filmmakers and will also screen films by Marsh and Fellom. ByLion is published weekly online (bi-weekly during the summer session) for the faculty and staff of Southeastern Louisiana University. Send submissions to publicinfo@selu.edu, SLU 10880, fax 985-549-2061, or bring to Public Information Office in East Stadium. Submission deadline is noon on Friday. Contact: Christina Chapple, chapple@selu.edu, 985-549-2341/2421.